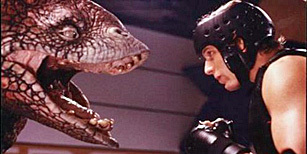 » A Sci-Fi Movie Review: ARENA (1989). A Sci-Fi Movie Review: ARENA (1989). ARENA. Empire Pictures, 1989. Paul Satterfield, Hamilton Camp, Claudia Christian, Marc Alaimo, Shari Shattuck, Armin Shimerman. Music by Richard Band. Director: Peter Manoogian. Here’s a movie that in some circles is thought of as a classic — the definition thereby of a cult classic? — that I had never heard of before, nor most of the players in it, but which nonetheless I found myself enjoying very much. Plotwise, it would be easy to describe the movie as part of the Rocky series in which the hero (Paul Satterfield) finds himself stranded on a world where the main attraction is a battle arena in which aliens from all over the galaxy take on all comers, and it is has been 50 years since an earthling has been the champion. Is Steve Armstrong the one to break such a long losing streak? This short synopsis may be all you need to know, either in terms of how the story line goes from there, or whether you decide(or not) that this a movie worth looking out for. To me the fight scenes, as always in fight movies, are something to endure, but even though the movie had a small budget, I thought the aliens were the best I’ve seen since the cantina on Mos Eisley, and what’s more, there were more of them. The players, except for Hamilton Camp, were all new names to me, although I did recognize Claudia Christian’s face from her later long recurring role on Babylon 5. As it turns out, however, that many of them have had long careers in projects such as this, both in the movies and on TV. They all know what they are doing, and what’s more, they do it with gusto. One scene toward the end, and in particular, is a real knockout. I thoroughly enjoyed Arena too, when seen decades ago. It has long been included in the recommended film lists on my web site. that was fun, but which never went anywhere in the ratings. One of many riffs on the Fredric Brown story. The titles are the same, Jerry, but I think that any other connection is tenuous at best. Steve Armstrong’s title match is just that, a fight, nothing more. The stakes are much less. Unless I remember it incorrectly, in Fred Brown’s story the fate of the entire human race depends on the result of the fight; not at all so in the movie. Steve compares Arena to Star Wars’ cantina in his review. Thanks for posting your list here, Mike. I’ve seen about half of these, and remember enjoying them. A few I’ve not heard of. I’ll have to check them out!